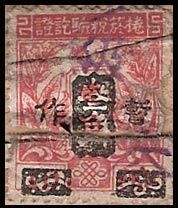 Prior to 1932 Japan leased part of the Liaodong peninsula from China, this included the important strategic ports of Darien and Port Arthur. 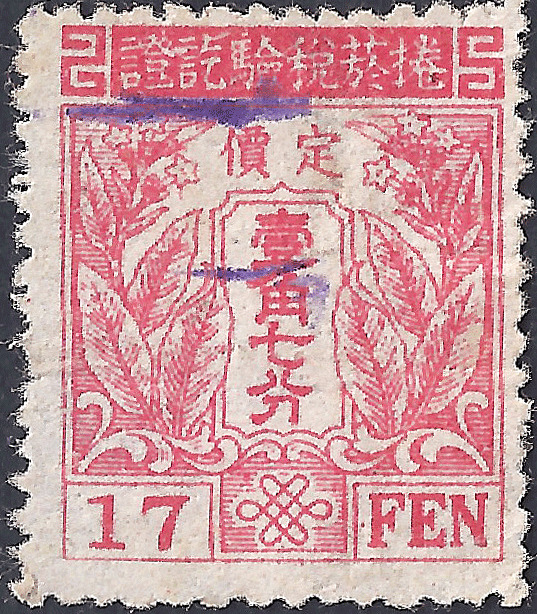 After the formation of Manchukuo this area came under the notional ownership of the Manchukuo government and Japan was granted a new lease. 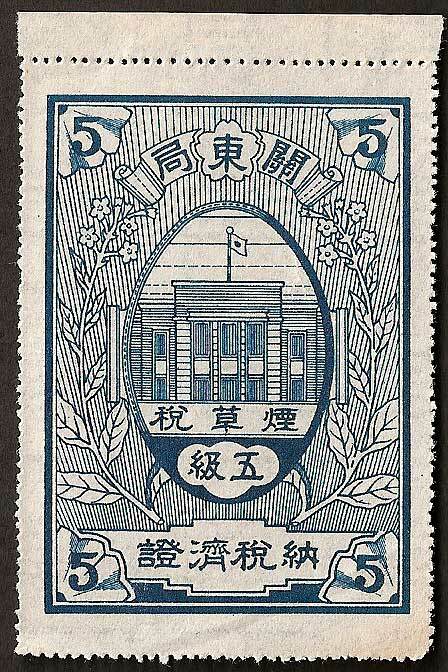 The Kwantung Leased Territory (KLT), although considered part of Manchukuo, was wholly administered by the Japanese. 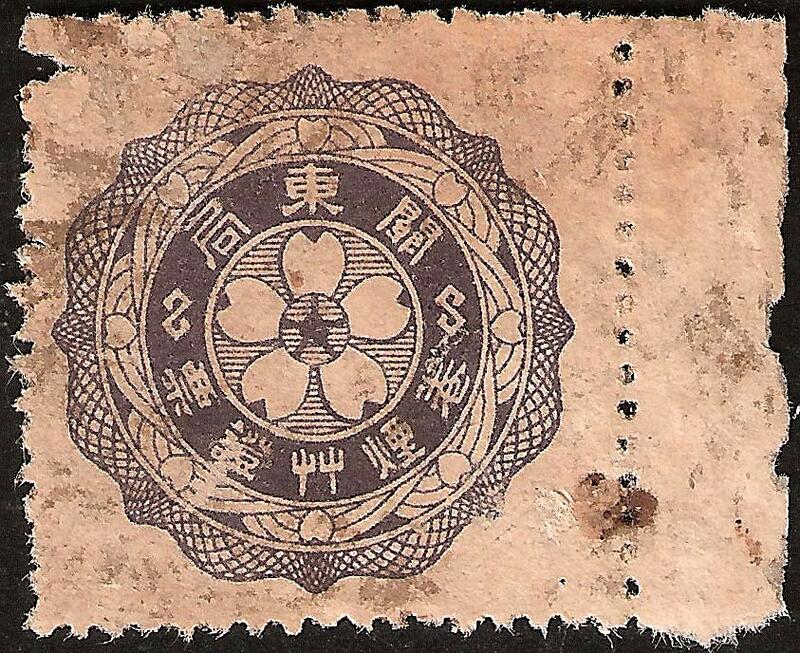 The Japanese issued their own tobacco tax revenue stamps for use in this region and some of these appear below. Much of the information below is the result of speculation, various writers on the subject have their own ideas about these stamps. 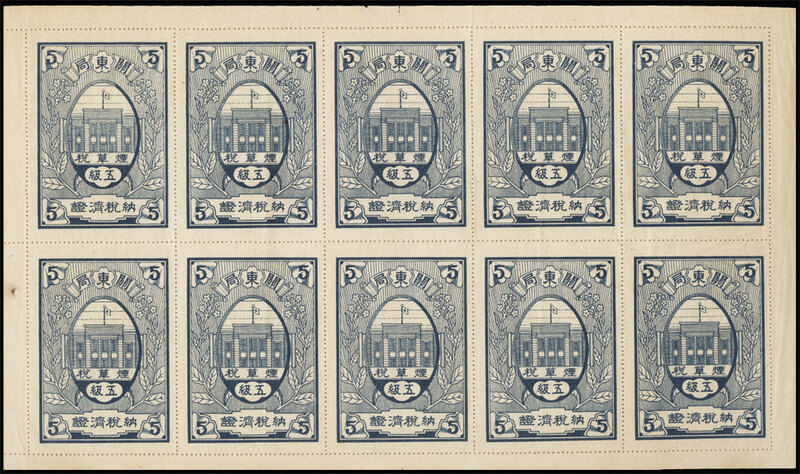 The most reliable source is probably “The Standard Catalog of Japanese Revenue Stamps,” by M. Shimomura, 1981, but in places the information below differs and may be right or wrong. Issued 20th June 1936 this revenue stamp was designed to seal an outer package of cigarettes and was intended to be torn when the pack was opened to avoid re-use. This is why the stamp needed to be so large. The tobacco was graded 1 to 7, with the class shown in Arabic numerals in each corner and in Chinese characters inside the oval cartouche. The full set therefore consists on 7 stamps. The stamps were engraved on watermarked white paper, details of printers and designers are unknown. Perf 12 x 12. Size 46.3mm x 65.7mm. 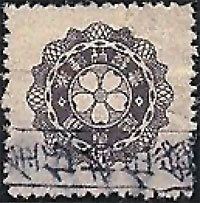 Sheets contain 10 stamps (2x5). 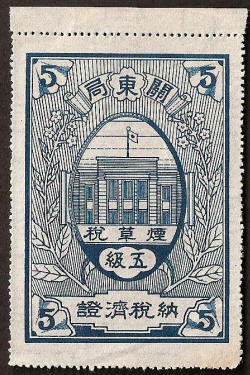 The stamp depicts The Kwantung Prefecture Offices - note the Japanese flag. The colour coding for the grades is: Class 1, Red - Class 2, Light Blue - Class 3, Brown - Class 4, Dark Blue - Class 5 Mid Blue - Class 6, Green - Class 7, Purple. The example shown is Class 5 mid blue. The smaller red label measures 33.4mm x 46mm - it may be some kind of design proof. Issued 20th June 1936. This issue was used as a tax paid revenue for cigarettes. The set uses the same seven colours one for each grade of tobacco. 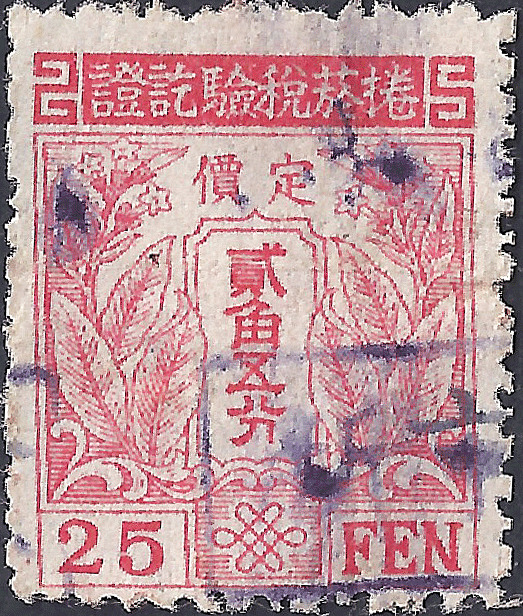 The colour coding is the same as the above with an extra value included for 250 Class 6 cigarettes (this is common all other values are scarce). The stamps were engraved on watermarked thin white paper, details of printers and designers are unknown. Perf 13 x 13½. Size 18.5mm x 22mm. Sheets of 20 see example here. 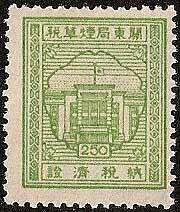 The stamp depicts The Kwantung Prefecture Offices. 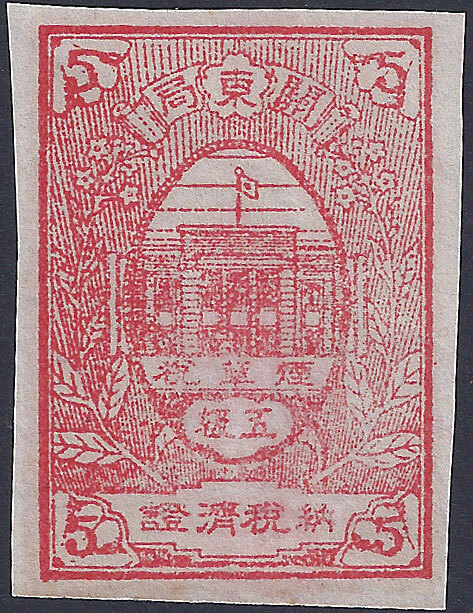 This item is listed in Encyclopedia Japanese Philately as a cigarette voucher which is printed in several different colours. It seems to have served the same purpose as a cigarette tax paid stamp, in that it sealed the packet. The stamps in use on a cigarette packets can be seen here. Litho, Perf 13. Design Size 24mm Diameter. No gum. 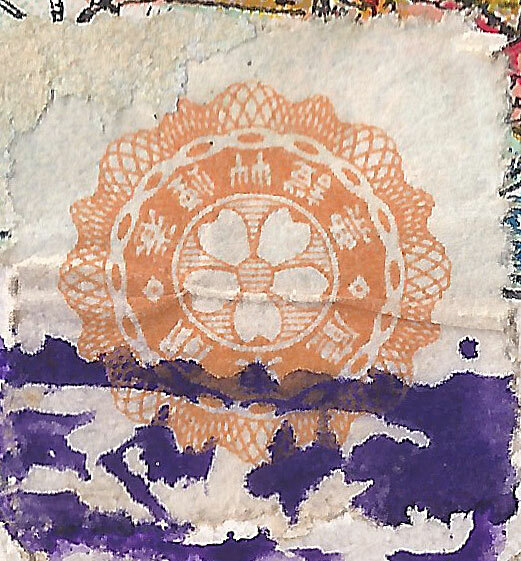 The stamp depicts a cherry blossom design. (Click on the image for a high resolution picture). 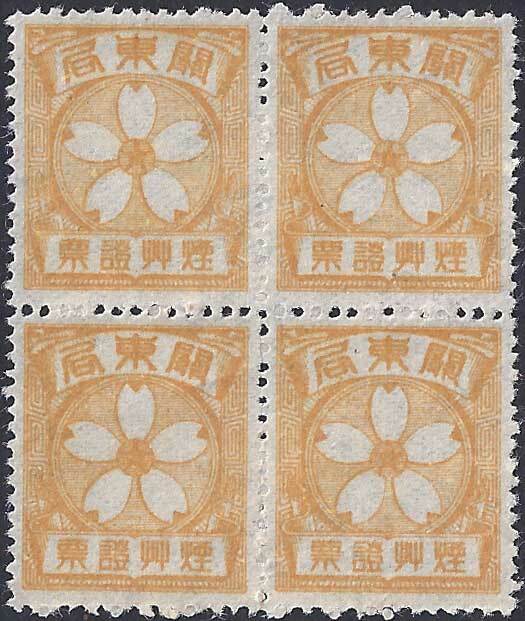 Shimomura lists a yellow and blue vesion of this stamp but is unaware of the red. A. W. Bendig also mentions this stamp or seal in his notes, he describes it as being red (as the remnant below) and perf 12½. 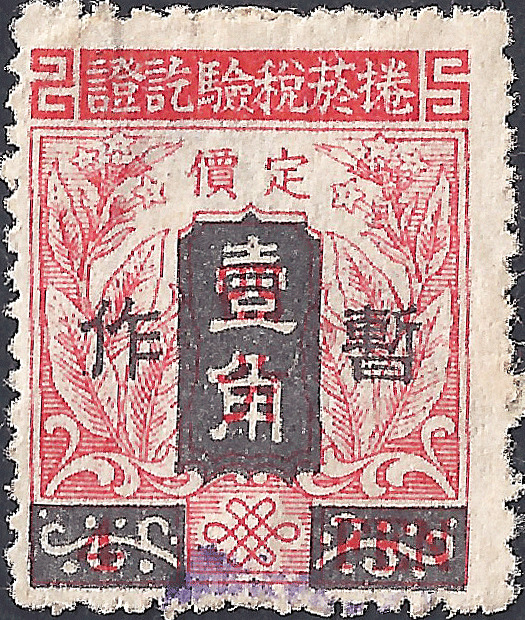 A very similar design existed in Japanese Occupied Micronesia and this is listed in Barefoot's South East Asia Revenues as a Tobacco Tax Stamp dating to c1935, in this instance overprinted with a monetary value. My theory is that these were Government issue cigarettes, which may explain why they carry a voucher instead of the usual tax paid stamp. 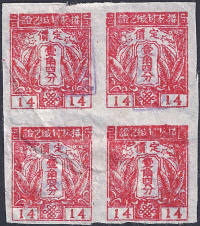 Complete unused stamps are almost unknown and the condition is usually very poor. Litho, Perf 13. Design Size 16mm Diameter. No gum. 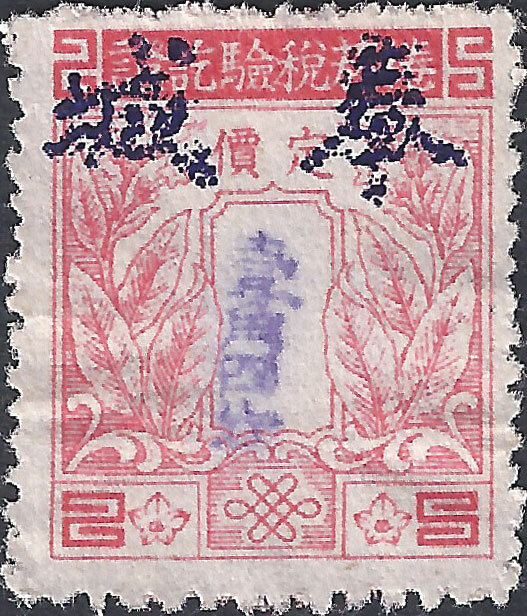 Note that size and the the inner border of the first stamp differs from the set above. It is possible that these revenues were used on the smaller packs of 5 cigarettes with a paper wrapper, larger quantities were sold in cardboard cigarette cartons. The yellow example appears on a packet of five "Pirate" Cigarettes by W. D. & H. O. Wills of England that can be can be seen here. 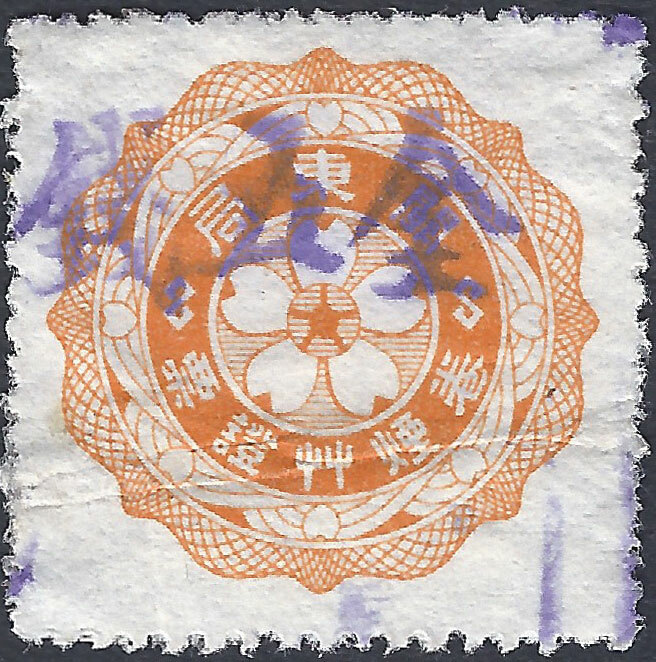 Used stamps all seem to carry an overprinted value in Japanese sen.
Shimomura list four colours red, orange, yellow and grey/purple. I suspect that only three colours existed and that these are red, orange/yellow and grey/purple. Both sets appear to use the same colours. Litho, Perf 13½. Design Size 19mm x 22½. No gum. 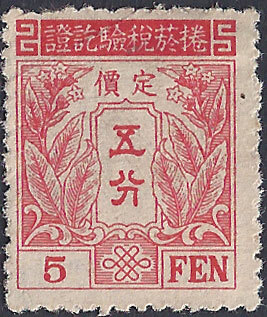 This stamp is not recorded and my guess is that it dates to 1936, it has clearly evolved from the designs shown above. 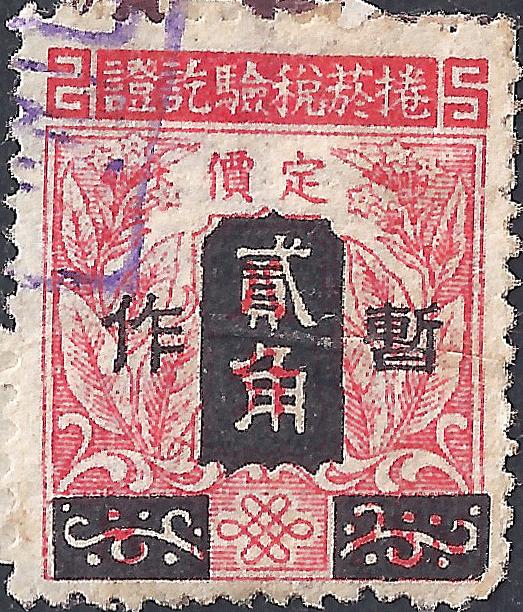 This stamp is thought to have been issued in 1939 and the value shown is the retail price of the tobacco purchased including tax. There are 16 values in the set which runs from 5f to 90f. 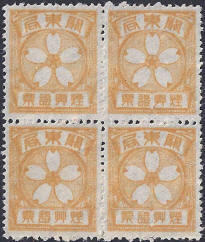 The value of each stamp is shown in the centre panel. The stamps were engraved on un-watermarked thin white paper, details of printers and designers are unknown. 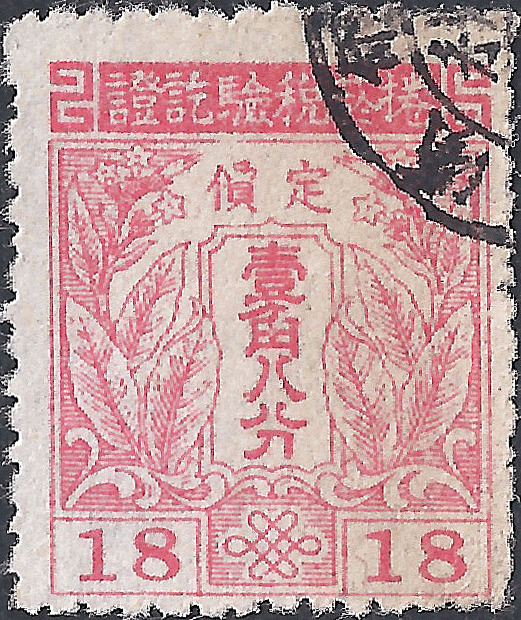 The stamp depicts Tobacco Leaves. 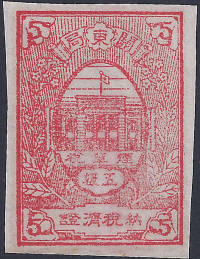 This is the first issue of duty paid Kwantung tobacco revenues. 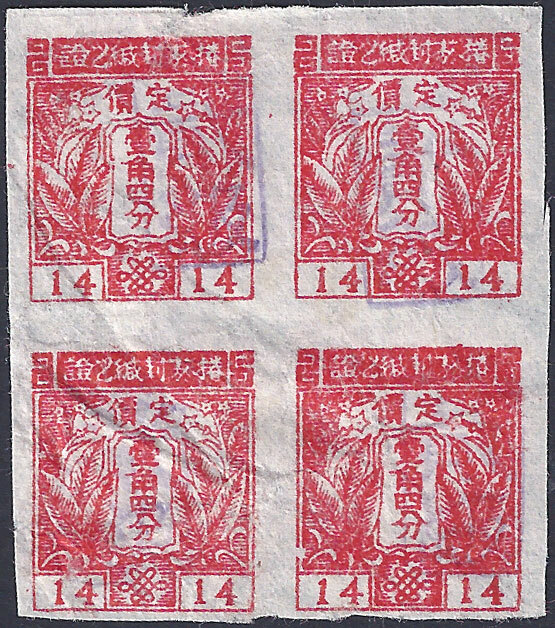 The stamps had a panel into which the cigarette packed value (inclusive of duty) was printed in red or violet. This part example shown would probably have had a value of 18f. These are hard to find even in poor condition as they had to be torn to open the packet. 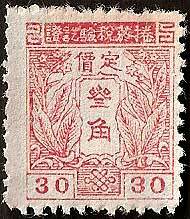 A 20f and 30f version has been recorded by Barefoot and the 38f is shown in “Standard Catalog The Japanese Revenue Stamps,” by M. Shimomura, (1981) and there may be many more. In this case the value is incorporated into the design, these are the most common. The reason for the 14f being imperf and the meaning of the cancel shown is unknown. 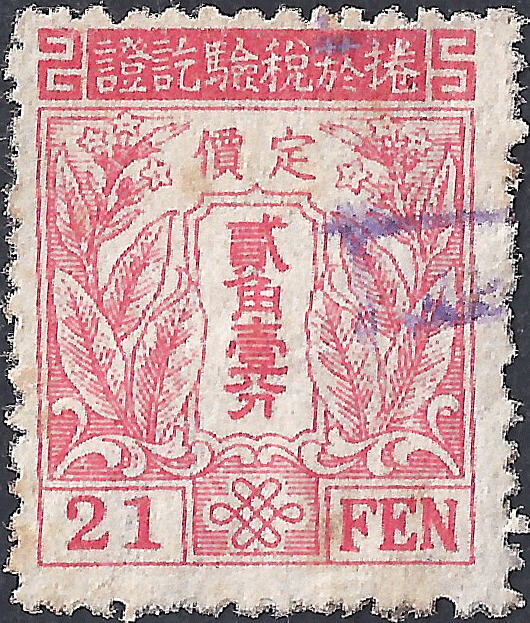 Note that the Chinese number 1 within the cartouche is different in the two types of 18f shown, this appears to have gone unreported in books on this subject. c1944. 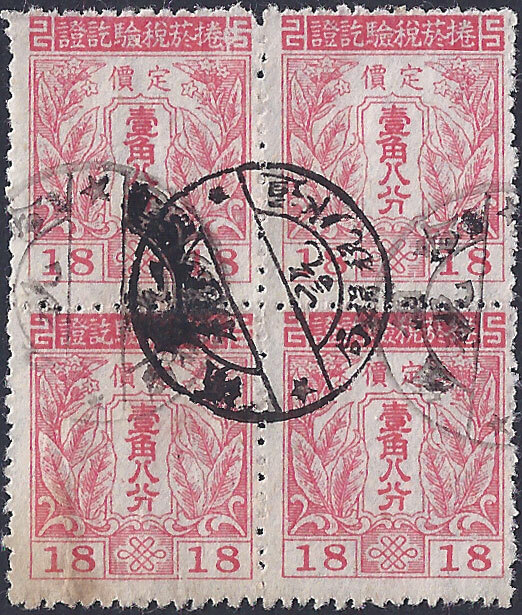 Surcharged example of the above stamps. 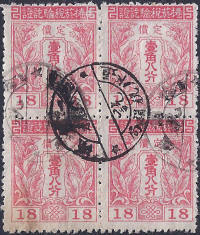 The surcharge shown in the black panel in the centre shows the new value in Chiao with 作暫 Temporary Use. The two rectangles at the base blank out the original value. 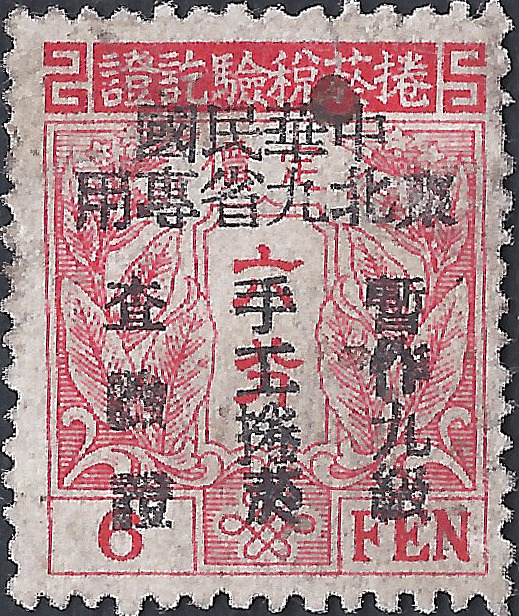 Other values are also known to have been surcharged with 10f on 5f, 20f on 5f and 30f in 17f, it must be assumed there was a shortage of these stamps to make this necessary. c1946. 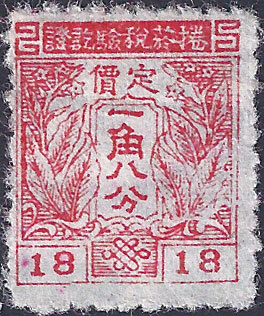 Republic of China post war surcharge reading Applied for 9th class tobacco North East China. 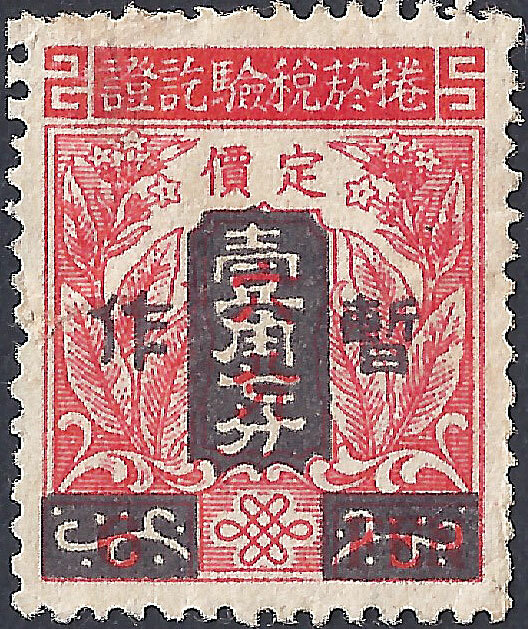 For more information see South East Asia Revenues by John Barefoot and published in 2006 by J Barefoot Ltd and “The Standard Catalog of Japanese Revenue Stamps,” by M. Shimomura, 1981 and Encyclopedia Japanese Philately.